DeMarcus Cousins found out he’d been traded to the Pelicans during a press conference. Enes Kanter was mid Periscope stream at a kids clinic when fans told him he’d been shipped to New York. However, the craziness brought about by the NBA trade deadline hit a new high (or is that low?) when Harrison Barnes was traded from the Mavericks to the Kings with 6.16 to go in the last quarter. A visibly shocked Barnes was sitting on the bench when news of the trade found its way into the stadium. The concept of an in-season trade period is a foreign concept to us Australians. For most of us it’s weird and confusing like someone trying to eat a meat pie with a knife and fork. ESPN Reporter Darren Rovell meets a true blue Aussie favourite. But randomly timed player trades are par for the course in US sports and this past week has been no different. Well actually it has. Since Anthony Davis signalled his intentions to leave New Orleans (in the hope of making to the Staples Centre), the NBA trade period has been crazier than when Ron Artest changed his name to Metta World Peace. In the past few days there have been more player movements than there were during the Aussie’s last tour of India. Because of this, the team at Fantasy Insider has decided to pen a DFS relevant breakdown of the NBA trade deadline. What are the DFS implications following the NBA Trade Deadline? Just one day after lighting up Madison Square Garden, Dennis Smith Jr was traded to the Knicks for injured centre Kristaps Porzingis. DSJ instantly becomes the Knick’s best player and they’ll now look to build around the young point guard and rookie Kevin Knox. The only thing stopping DSJ from becoming a DFS staple is the lowly position of his new team. There’s more than half a season to go for most NBA teams, but for the Knicks, they might as well start planning for next year. DSJ won’t be wrapped in cotton wool just yet, but don’t expect him to close out the season. Speaking of cotton wool, that’s exactly where Porzingis is going to stay. KP is continuing his recovery from an ACL and the Mavs have already stated that he’s not expected to play this season. The two teams also exchanged a host of other players in this trade with DeAndre Jordan and Wesley Matthews sent to the Knicks and Courtney Lee, Tim Hardaway Jr and Trey Burke heading to Dallas. None of these players feature very often in winning DFS lineups and nor do they get any real bump from the location changes. DeAndre Jordan is currently the 15th ranked centre in terms of total fantasy points scored per game. Jordan’s job security is strong, unless the Knicks decide to give rookie Mitch Robinson some game time. Finally, Tim Hardaway Jr has had some massive fantasy games in the past, but I’d only be giving THJ a run due to matchups or injuries (Note: The Knicks have waived Enes Kanter). A complicated trade here without much DFS relevance. You’d be scraping the barrel if any of Brandon Knight, Marquesse Chris, Wade Baldwin and Nik Stauskas made it into your lineups. Alec Burks and Iman Shumpert are viable given the right situation but this is a trade we can largely ignore. Again, not much DFS relevance here. Reggie Bullock does provide the Lakers with some better long-range shooting ability but the salary would need to be juicy, the matchup would need to be elite and the minutes guaranteed for Bullock to force his way into your lineup. Here. We. Go. This trade seemed to appear out of nowhere and involved a total of six players and four draft picks – leading many to theorise that the Clippers are planning something big. Clearly, the 76ers see that their window is open and the addition of Tobias Harris provides another important avenue to scoring. However, from a DFS perspective, Harris’ arrival may hurt his own fantasy potential and that of his teammates. Until their chemistry is established, be cautious of Philly and be aware that the ceilings of Simmonds, Butler and Harris will all take a hit. Yet all is not lost as leading fantasy centre, Joel Embiid, will still have his monstrous games (if Boban doesn’t keep him off the court). The steak knives here aren’t worth much of a discussion. If Twitter mentions and memes were worth fantasy points that Boban Marjanovic would be a daily lock, but sadly, the big friendly giant is only averaging 10 minutes a game this season (his career average is 9 minutes). Landry Shamet showed some potential this year both on the court and as a fantasy player, but we’ll have to wait and see how much of a run the rookie guard gets at the Clippers. We were a bit surprised to see Pistons trade their second shooter in a matter of days. Trading away both Stanley Johnson and Bullock does leave the Pistons a little short on shooters, but who are we to judge? You’d assume that Thon Maker becomes the Piston’s first reserve centre behind Mr 20-20 (Andre Drummond). There isn’t a single Australian sports fan who doesn’t want to see Thon Maker log some more NBA minutes and hopefully this will happen in Detroit. The Pelicans joined this trade late in the piece, snapping up Johnson, Jason Smith and some picks in exchange of Nikola Mirotic. This could be a significant move for DFS purposes. Mirotic should now lead the scoring for Bucks 2nd unit and his ceiling will remain relatively high. However, the real beneficiary of Mirotic’s departure is the Pelican’s Julius Randle who’ll no longer be forced to split his minutes with Mirotic. At first glance, this seems like a nothing for nothing trade and maybe it is. Ryan Anderson has only played 15 games this season and doesn’t add much value (real or fantasy) to a Heat lineup which already has a deep lineup of mediocre players. 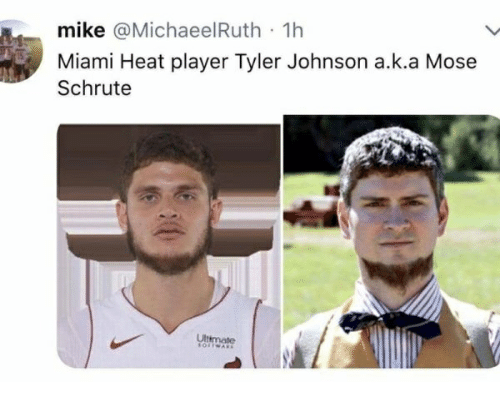 Wayne Ellington’s management is trying to get him waived from the Suns already, leaving back-up guard and part-time Mose Schrute impersonator, Tyler Johnson, to discuss. Now, straight off the bat, Johnson isn’t rated highly by the Fantasy Insider team. However, it will be interesting to see what role Johnson plays at the Suns. Phoenix have placed significant responsibility on young point guards De’Anthony Melton and Elie Okobo and, as expected, they haven’t exactly risen to the occasion. Even if Johnson remains a bench player, he’ll provide much needed assistance Melton and Okobo, but also to Suns marquee and golden goose, Devin Booker. We all love a good Woj bomb, but the one that dropped just 4 minutes before the Draftstars Thursday slate lockout sent many coaches scrambling. The veteran NBA reporter informed us all that Otto Porter Jr was being sent to Chicago in return for Jabari Parker and Bobby Portis. This trade cost 238 Draftstars players approximately $3,500 and led many to plead once again for DS to introduce late swaps. Porter is a popular DFS player and when the matchup and salary is right, he’s an excellent GPP play. In moving from one struggling team to another, it’s difficult to predict the impact of Porter’s new home. That said, his ceiling should receive a slight bump in Chicago. Jabari Parker has had an inconsistent year after returning from a serious achilles injury late last season. With role changes and form issues, a change of scenery could see Parker become fantasy relevant again. Portis’ ceiling has also been high – almost as high as the possibility that he might punch a teammate in the face. With the Wizards short on bigs (pun intended), Portis may even come straight into the Wizards starting 5. If he does, Portis becomes one of the most relevant DFS players of the trade period. Apparently Harrison Barnes knew there was strong possibility he’d be shipped to the Kings before he played on Wednesday. Trading Barnes provides the Mavs with the salary cap relief they need to fit KP. Barnes is a great match for the Kings, especially as they continue to make a push for the playoffs. Although Fox and Heild have had excellent seasons, their fantasy output has been a little inconsistent. The arrival of Barnes could add further volatility to these scores, so we suggest a wait and see approach for the first few weeks of this new partnership. The arrival of Justin Jackson and Zach Randolph should have little fantasy impact in Dallas. The Wizards and Pelicans arranged depth players as Markieff Morris and Wesley Johnson swapped teams. Neither player has immediate fantasy appeal but Morris gets a bump if AD fails to reappear. (Note: Morris is likely to be released by the Pelicans). James Ennis was sent to Philly in exchange for some draft picks. Ennis was excess depth at Houston but at the 76ers, he could easily start seeing around 20-25 minutes per night. As mentioned previously, the post-trade Philly bench doesn’t look great and Ennis is a valuable addition. A formidable starting 5 just became even more impressive with the addition of centre Marc Gasol. On his own, I’ve never been a huge fan of Gasol but in a quality team like the Raptors, this move is a pure muscle flex in the face of other Eastern Conference teams. From a DFS perspective, Gasol has always had a solid floor and this shouldn’t really change for the move up north. In contrast, I’m a huge fan of Jonas Valanciunas. Unfortunately, JV’s minutes have been horribly inconsistent throughout his career and we’ve rarely seen him completely unleashed. JV should become the Grizzlies starting centre, so perhaps he’ll finally get a chance to establish himself as the fantasy pig I believe he can be. Lakers finally get their m…Muscala? The Lakers went fishing for a whale and ended up landing a guppy. Mike Muscala moves to LA, from LA (following his previous trade from the Sixers), in return for Michael Beasley and Ivica Zubac. These are largely DFS irrelevant trades although I do feel sorry for Zubac. The young centre has talent but it was clear from the way he was being played that he wasn’t part of the Lakers’ future. Former number one draft pick Markelle Fultz was finally put out of the agony that was his life at Philly. Fultz makes his way to Orlando and, once – if – fully fit (that’s a BIG if…), hopefully he’ll be given a proper chance at fulfilling his obvious potential. Jonathan Simmons will take his place on the Philly bench in a move that adds further shooting depth and athleticism. Simmonds can be considered only when his role and minutes become more clear.